Erin here – Add this to your next batch cooking day plan!!! It always feels great when we can make a meal go just as far as possible, and this is one of my favorite ways to stretch a whole chicken into three meals. In addition to saving on the budget, it also saves a lot of prep time in the kitchen and makes it easy to plan meals for the week – perfect for these busy summer days! In a pinch, you can buy a Rotisserie chicken from your favorite deli if you don’t have time to roast the chicken yourself, and I even like to buy the pizza dough from the deli and roll it out at home if I don’t have any left in the freezer. Serve the roasted chicken on the first night, reserve a 1/2 cup of shredded chicken for the pizza on night two, and pick the bones clean then use all of the remaining chicken to make chicken noodle soup on the third night. Clean the chicken and remove any giblets. Combine all spices and garlic in a small bowl. Place in crockpot and cook on low for 4 to 6 hours. 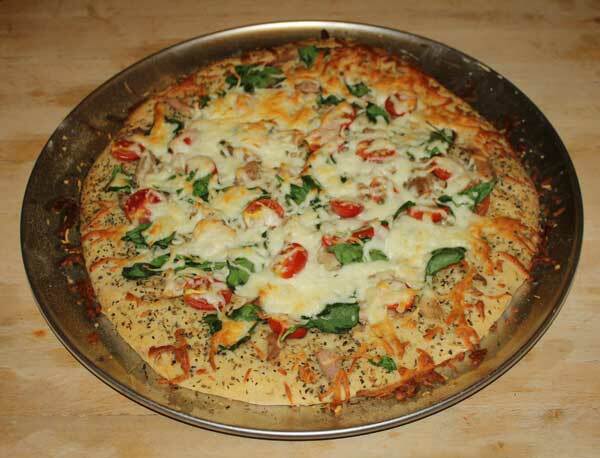 Brush prepared pizza crust or dough with olive oil and sprinkle Italian seasoning on top. Distribute half cup of shredded chicken evenly on top of the dough. Cut grape tomatoes in half, then place them and the spinach leaves evenly on top of the dough. Sprinkle mozzarella cheese over the pizza and bake according to your chosen crust directions. Cut up the carrots, onion and celery sticks into bite sized pieces and place in a large pot. Pour in chicken broth and sprinkle with seasonings, then stir. Bring to a boil then reduce to a simmer for 45 minutes to one hour or until veggies are tender. Increase heat and add egg noodles and chicken for 15 minutes. I love this concept of what I call “planned overs” where parts of a future meal are already prepared and ready to go for another meal. Serious question, however, is why does the chicken soup recipe call for purchasing 4 cups of canned chicken broth? After deboning the chicken after dinner on night 1, place the carcass in a crockpot along with any pan drippings after deglazing the baking dish, cover with water and let cook. Strain, cool, refrigerate. FREE chicken stock. Depending upon the spices chosen for roasting the chicken, it could also be salt free, if preferred. When calling for chicken stock, remove the hardened fat layer and you now have fat free stock. This is awesome!! And just in time for my menu planning. Thanks so much Denise! Also if you use veggies in other meals you are going to cut off certain parts of the veggies and you can save these parts in a gallon size freezer bag in the freezer until you need to make some stock again! Then just pull out your bag and toss into into a large pot, top with water, season how you like, bring it to a boil and then turn down the heat and simmer for atleast an hour. Strain off all of the veggies and you have stock! Hi Denise! I have come to your blog often, you have so many ideas. Everything is practical and easy. I have come to appreciate that. I posted on my blog your ideas for the Rottisserie Chicken, again recipes that are easy and stretches your budget.